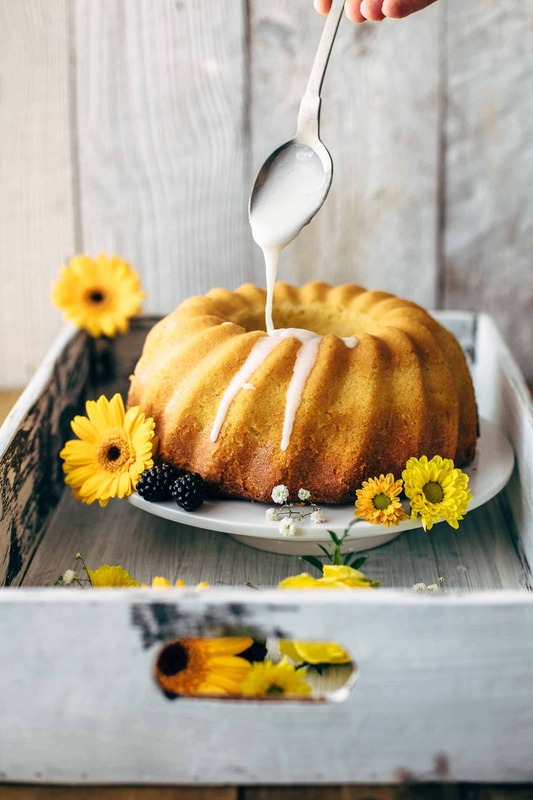 This Cream Cheese Swirled Lemon Bundt Cake is dense, moist, and intensely lemony. It is the perfect cake for any occasion. With video! I can’t believe how time flies by. Looking at our marriage photos make me realize how much happened over the past 10 years. Oh yeah, and I also realize that we both had terrible haircuts. Different jobs, different apartments, self-employment, and always the feeling that there is “more” out there. Austria is such a small country that everything is very limited. Of course, it also has its bright sides. But if you are hungry for adventures and are willing to take risks, this country is too small. Not everything is possible here. The next big step for us is the move to the US. I’m already excited about what we will learn, discover, and experience. The coming 10 years will be even more diversified and exciting than the past 10 years were. For our anniversary, I made this Cream Cheese Swirled Lemon Bundt Cake. It is the perfect cake for this special occasion. We both love it. It is summery, sweet, and lemony. And that cream cheese swirl!! It’s like the cherry on top of a milkshake. Everything starts with greasing and flouring the bundt pan. This is almost a science. In the past, I was greasing the bundt pan with a piece of hard butter between my fingers. And the longer you have that piece of butter between your fingers, the messier it gets. The butter melts between your fingers, and you have the feeling that you have more butter on your fingers than in the pan. The hardest parts are the edges. The butter must be in all edges otherwise you run the risk that the bundt cake doesn’t come out beautifully or at all. Latest when you flour the pan, you see how much spots are not properly greased. A tip of a good friend of mine changed everything. She told me that she is greasing the bundt pan with melted butter and a brush. Duh! So obvious! And I, a so-called experienced baker, didn’t think about that…? The best is when you heat about 1 tbsp of butter in the microwave until almost completely melted. Then stir until completely melted. Brush the inside of a bundt pan with melted butter that it is completely greased. Make sure that you don’t use more butter as needed that it doesn’t stand in the edges in the bottom of the pan. 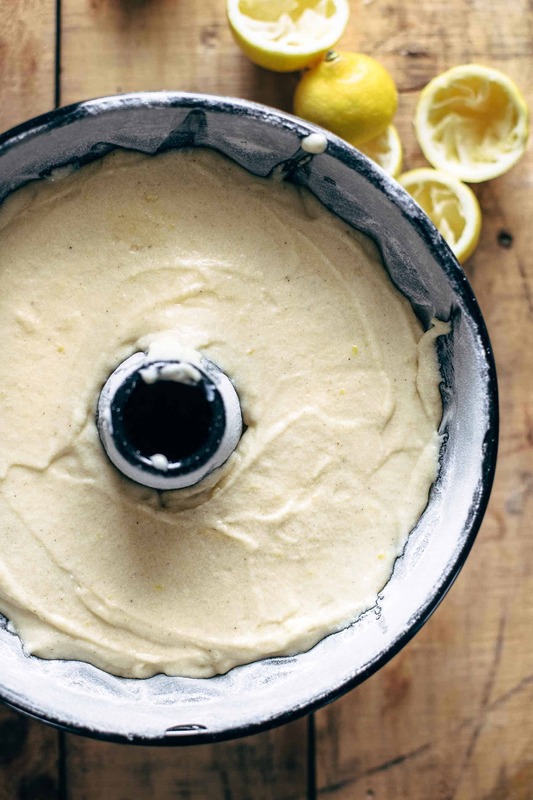 Now we know how to grease a bundt pan like a pro. Let’s see how we flour the pan. 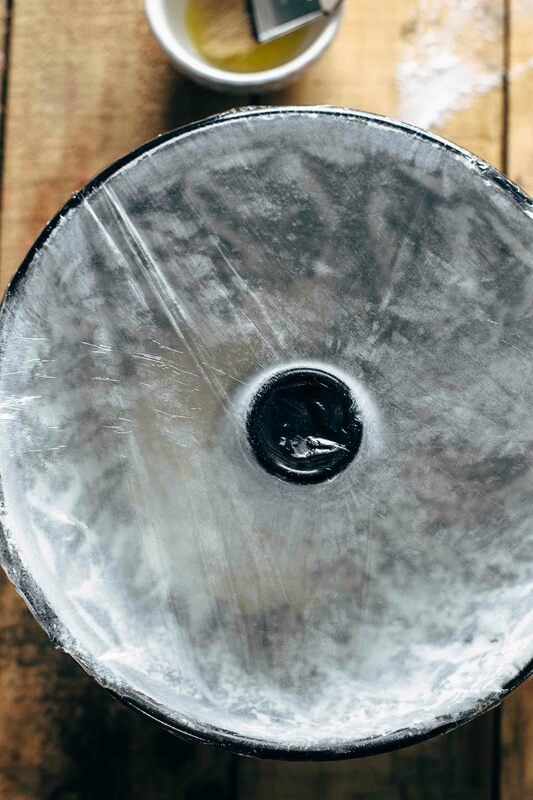 A better way to flour the bundt pan is to put some flour into the pan and then wrap the bundt pan in plastic foil tightly. And now shake it. Until everything is covered. And I mean everything. I love this tip from my friend Julia, and it is very smart to do it this way. Maybe you think that this is normal to do it this way, maybe it’s just an “Austrian thing” not to know how to grease and flour a bundt pan. 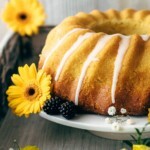 The lemon bundt cake is very moist and dense, and it tastes incredibly lemony. 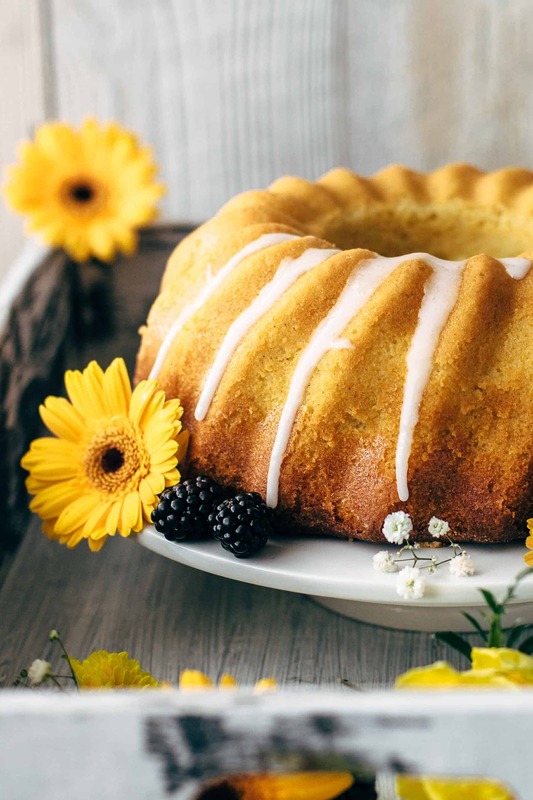 What is in the lemon bundt cake? Flour, cornstarch, salt, baking powder, baking soda, butter, sugar, eggs, vanilla, lemon, and buttermilk. If you use all-purpose flour as I did, then the cornstarch is necessary to add. 2+3/4 cups all-purpose flour and 1/4 cup cornstarch are in the batter. If you use cake flour, you can take 3 cups of cake flour instead and don’t need the cornstarch. 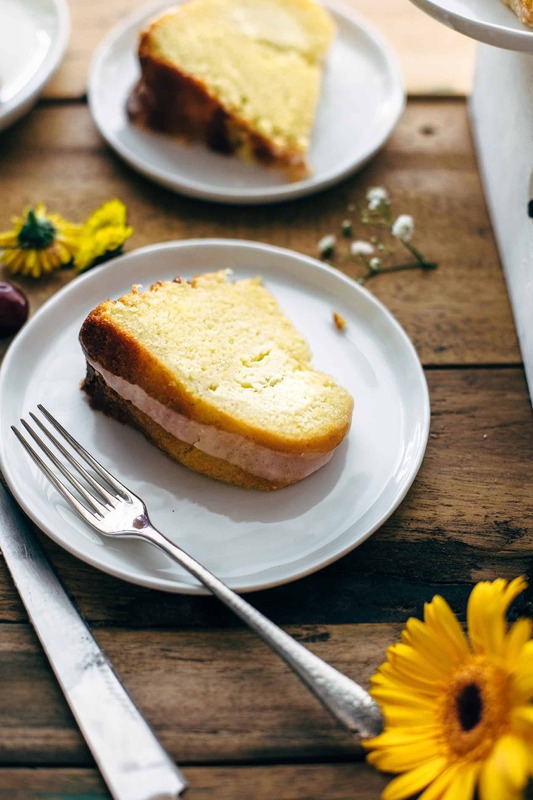 The lemon cake won’t rise that high because there is just 1/2 tsp of baking powder and 1/2 tsp of baking soda in the batter. But this is actually a good thing. When a bundt cake rises too high during baking, it can collapse after removing from the oven. The texture will be too dense then. Also, too many wet ingredients can cause a too dense bundt cake. Make sure that you measure correctly to avoid this mistake. And do not add more lemon juice than a 1/2 cup. The last tip for the best bundt cake texture is: wet ingredients should be room temperature. When the wet ingredients are room temperature, they combine much better and faster. You don’t have the risk to overmix the batter. 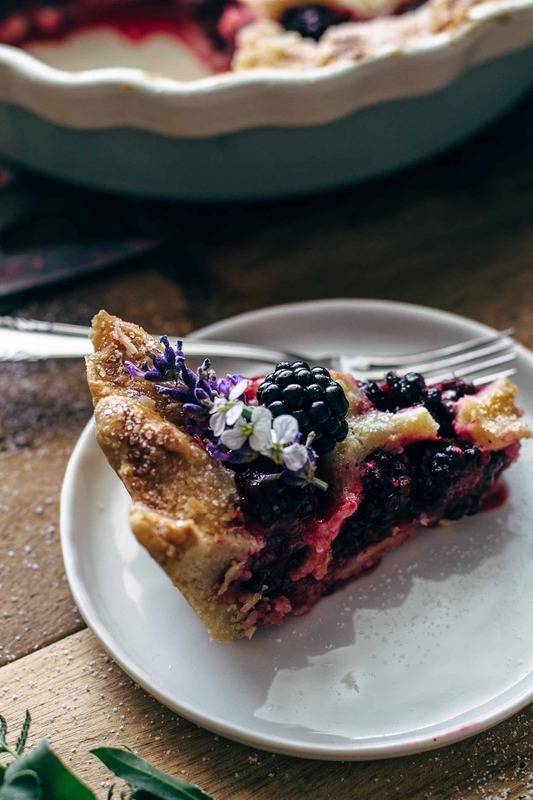 Overmixing produces too much air in the batter and then it is again the risk that it collapses after removing from the oven. 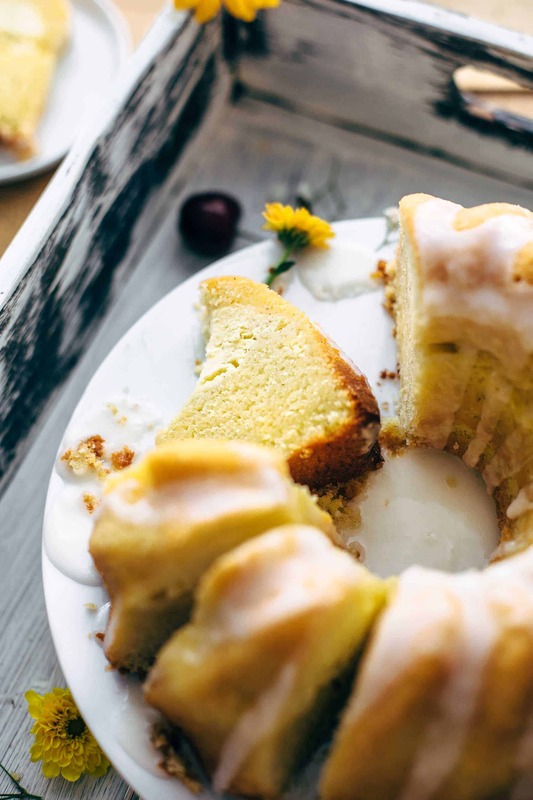 You could bake the lemon bundt cake without the cream cheese swirl by just leaving it out. BUT. Please make it with the cream cheese swirl. Please. BECAUSE IT IS SO SO GOOD. The cream cheese and the lemon harmonize perfectly. It is like they should be together, you know what I mean? 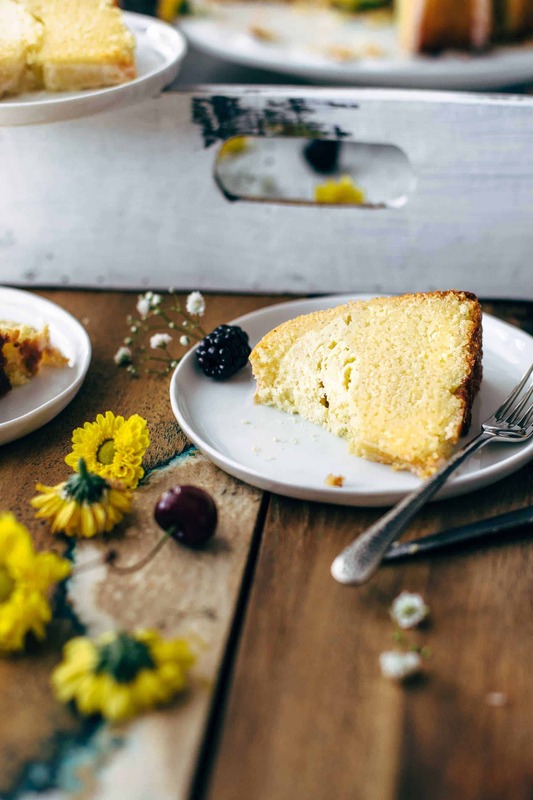 Even if the lemon cake is dense in texture, it is the perfect summer cake because of its fresh taste. After baking let the cake 1 hour in the pan to cool down. Then invert the pan onto a wire rack and let the cake cool to room temperature. Before serving, drizzle it with lemon glaze. I really would love to hear how you grease and flour your pan. Was just me who was in the dark? 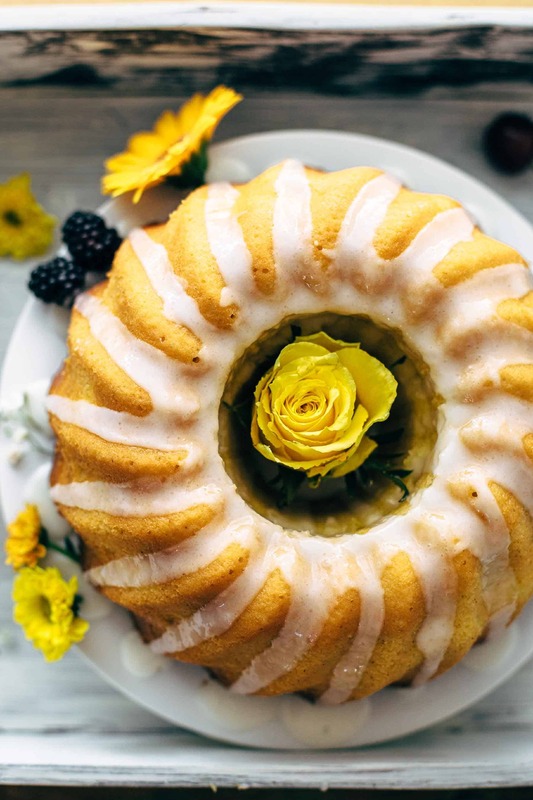 Make this ream Cheese Swirled Lemon Bundt Cake recipe and leave a comment, rate it and tag a photo #alsothecrumbsplease on Instagram! Would love to see your snap! 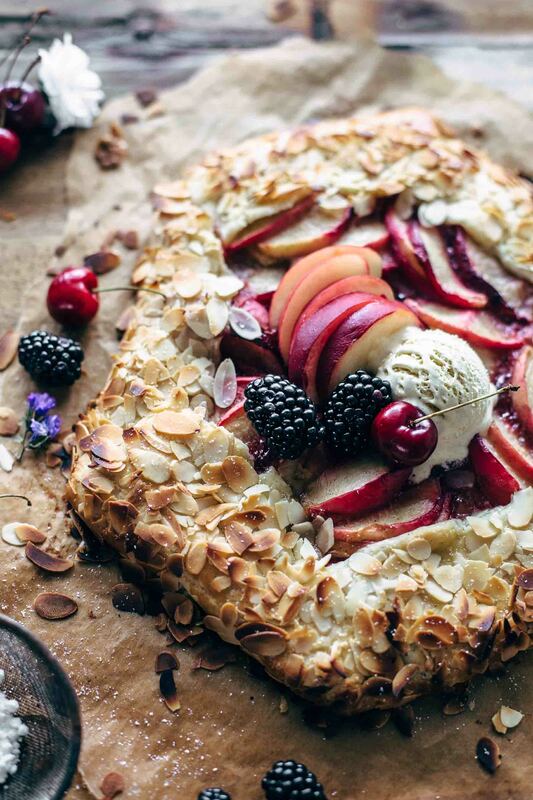 You may also like Fresh Cherry Cake, Almond Peach Galette, Blackberry Pie, Easy Raspberry Cake, or click here to see all recipes. Cream Cheese Swirl: In a large bowl, stir cream cheese, egg, sugar, and vanilla to combine. Set aside. Preheat oven to 350°F / 175°C. Grease and flour a 10 inches (25cm) bundt pan. Read blog post above, to know how to grease and flour a bundt pan the easiest way. Set aside. 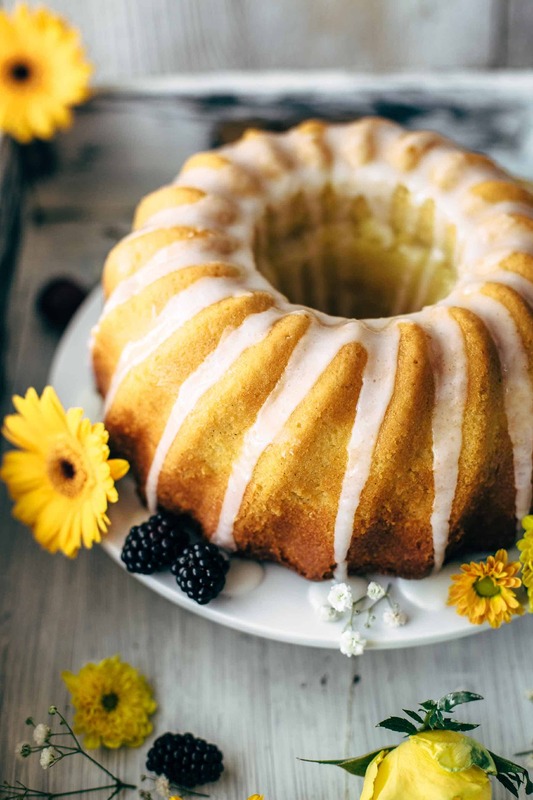 Lemon Bundt Cake: In a medium bowl, combine flour, cornstarch, baking powder, baking soda, and salt. Set aside. In a large mixing bowl, using a handheld or stand mixer fitted with a whisk or paddle attachment beat butter on medium speed until creamy, about 1-2 minutes. Beat in sugar until pale and creamy, 1-2 minutes. Beat in eggs, on at the time, until combined. Add vanilla and mix to combine. Slowly mix in lemon zest and juice just until combined. Alternately add dry ingredients and buttermilk and whisk just until combined. Do not overmix at any step. Begin and end with dry ingredients. Spoon the half of the lemon cake batter into the prepared pan. Spoon cream cheese filling evenly on top. Spoon remaining lemon cake batter on top. Bake for 55-70 minutes or until a toothpick inserted in the middle comes out clean. Depending on the shape of your bundt pan, the baking time may vary. Remove from oven and let cool for 1 hour. After cooling, invert bundt cake onto a wire rack to cool completely. Lemon Glaze: Place powdered sugar in a bowl and stir in 1 tsp lemon juice at the time until it is a thick glaze. It should drip down slowly but shouldn't be transparent. Try it on the side of your bowl. When it is too thin, it will run down the cake. Drizzle over cooled cake just before serving. Store leftovers in an airtight container in the fridge up to 2 days. Congratulations on the 10-year anniversary, Sabine and Mario!!! I’ve seen the one picture of you two on your “About” section and it makes me smile, and I know it is not much to go off of, but you two are very special. Your followers can tell how much you cherish Mario just by the recipes you create with him in mind, or just be the mere mention of what you two are up to in your posts. It’s always a wonderful thing to see or read about when someone can effuse such care, love, and respect for their significant-other. Now…I want to see a picture of those bad haircuts you two were sporting 🙂 Also, I apologize for not being able to offer you any tips on greasing and flouring a bundt pan (I can’t bake!) I am waiting for you to come to the U.S. and teach me your magical ways. Enjoy your special day, Sabine & Mario. Amanda, thank you so much! We enjoyed our anniversary. Yes, we are two of a kind and soulmates. I know that this is not a matter of course to have such a deep and strong relationship. I’m aware that this is something special between Mario and me. Haha, never mind because of the greasing and flouring a bundt pan. (; Thank you for your lovely comment. Have a great weekend, Amanda! Can you swirl the cream cheese like when you do a marble cake. I don’t like biting into a big hunk of cream cheese. 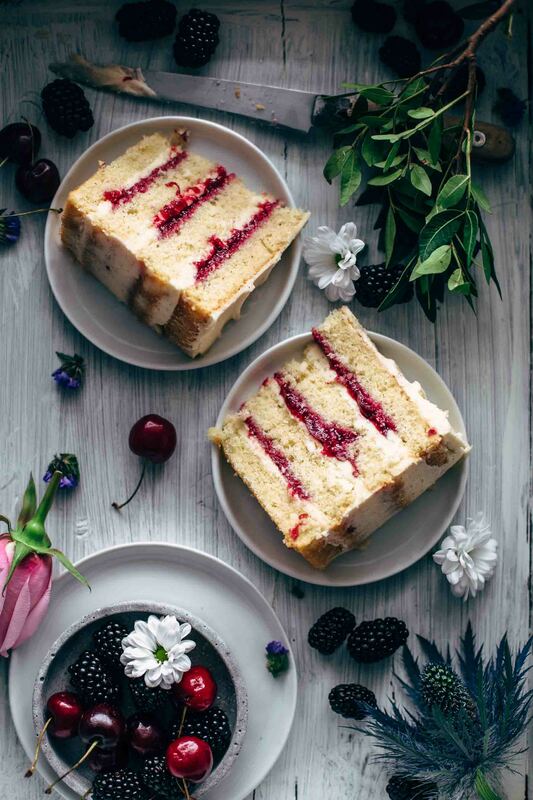 Have made a similar recipe and that’s what you get when you bite into the middle of the slice of cake. Unfortunately, no. 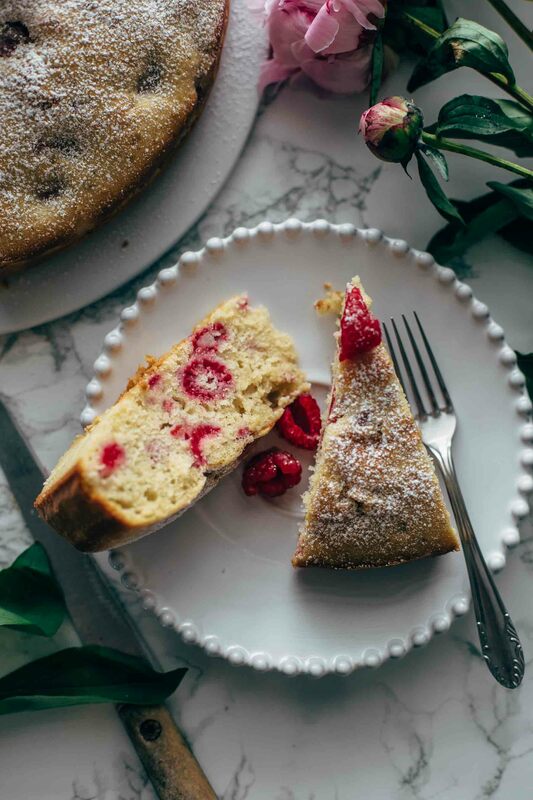 The cream cheese should be in one place in the center of the cake. Otherwise, the texture wouldn’t be fine when the cream cheese and the cake batter mix up too much. Would love to make this cake, but i have a 6″ bundt pan. How much should i downsize the recipe to fit my pan.? I’ve never made the cake in a smaller pan. But Because a 6″ bundt pan can hold the half of the capacity of the 10″ bundt pan, I suggest cutting the ingredients in half. Hopefully, that helps!